This publication list has been extracted automatically from the bibliography database of the Chair of Programming. If you find here only a preprint of the paper you seek, please inquire and the publication will be mailed to you individually. Stefan Kronawitter and Christian Lengauer. Polyhedral Search Space Exploration in the ExaStencils Code Generator. ACM Transactions on Architecture and Code Optimization (TACO) , 15(4):40:1–40:25, January 2019. Open access. Presented at HiPEAC 2019. Sebastian Hack, Paul H. J. Kelly, and Christian Lengauer (editors). Loop Optimization (Dagstuhl Seminar 18111). Dagstuhl Reports , 8(3):39–59, July 2018. Christian Lengauer, Luc Bougé, and Denis Trystram (editors). Special Issue: Euro-Par 2016. Concurrency and Computation: Practice and Experience , 29(15):4204:1–4204:2, August 2017. Christian Lengauer, Luc Bougé, and Jesper Larsson Träff (editors). Special Issue: Euro-Par 2015. Concurrency and Computation: Practice and Experience , 28(12):3445–3446, August 2016. Christian Lengauer, Luc Bougé, and Fernando Silva (editors). Special Issue: Euro-Par 2014. Concurrency and Computation: Practice and Experience , 27(16):4073–4074, November 2015. Luis Lopes, Christian Lengauer, and others (eds.). Euro-Par 2014: Parallel Processing Workshops, Part I . Number 8805 in Lecture Notes in Computer Science. Springer, 2014. Luis Lopes, Christian Lengauer, and others (eds.). Euro-Par 2014: Parallel Processing Workshops, Part II . Number 8806 in Lecture Notes in Computer Science. Springer, 2014. Christian Lengauer, Luc Bougé, and Felix Wolf (editors). Special Issue: Euro-Par 2013. Concurrency and Computation: Practice and Experience , 26(14):2345–2346, September 2014. Luc Bougé and Christian Lengauer (editors). Special Issue: Euro-Par 2012. Concurrency and Computation: Practice and Experience , 25(17):2343–2344, December 2013. Luc Bougé and Christian Lengauer (editors). Special Issue: Euro-Par 2011. Concurrency and Computation: Practice and Experience , 25(4):510–512, March 2013. Luc Bougé and Christian Lengauer (editors). Special Issue: Euro-Par 2010. Concurrency and Computation: Practice and Experience , 23(17):2137–2139, December 2011. Christian Lengauer. Owicki-Gries Method of Axiomatic Verification. In David Padua et al., editors, Encyclopedia of Parallel Computing , pages 1401–1406. Springer, September 2011. Christian Lengauer. Axiomatic Verification of Monitors. In David Padua et al., editors, Encyclopedia of Parallel Computing , pages 1173–1177. Springer, September 2011. Paul Feautrier and Christian Lengauer. Polyhedron Model. In David Padua et al., editors, Encyclopedia of Parallel Computing , pages 1581–1592. Springer, September 2011. Martin Fränzle and Christian Lengauer. Semantic Independence. In David Padua et al., editors, Encyclopedia of Parallel Computing , pages 1803–1810. Springer, September 2011. David Padua, Christian Lengauer, and others (editors). Encyclopedia of Parallel Computing . Springer, September 2011. Luc Bougé and Christian Lengauer (editors). Special Issue: Euro-Par 2009. Concurrency and Computation: Practice and Experience , 23(2):143–144, February 2011. Luc Bougé and Christian Lengauer (editors). Special Issue: Euro-Par 2008. Concurrency and Computation: Practice and Experience , 21(14):1757–1759, September 2009. Luc Bougé and Christian Lengauer (editors). Special Issue: Euro-Par 2007. Concurrency and Computation: Practice and Experience , 21(7):855–857, May 2009. Michael Claßen, Philipp Claßen, Christian Lengauer, Jan Dünnweber, and Sergei Gorlatch. Adapting Loop Parallelization to the Grid. In Proceedings of the Programming Model Institute Technical Meeting 2008 , number TR-0138 in CoreGRID Technical Reports, pages 4–10, 2008. Johannes Tomasoni, Jan Dünnweber, Sergei Gorlatch, Michael Claßen, Philipp Claßen, and Christian Lengauer. LooPo-HOC: A Grid Component with Embedded Loop Parallelization. In Sergei Gorlatch, Paraskevi Fragopoulou, and Thierry Priol, editors, Grid Computing: Achievements and Prospects , pages 261–274. Springer-Verlag, 2008. Johannes Tomasoni, Jan Dünnweber, Sergei Gorlatch, Michael Claßen, Philipp Claßen, and Christian Lengauer. LooPo-HOC: A Grid Component with Embedded Loop Parallelization. In Sergei Gorlatch, Paraskevi Fragopoulou, and Thierry Priol, editors, Integrated Research in Grid Computing, CoreGRID Integration Workshop , pages 241–252. Crete University Press, 2008. Michael Claßen, Philipp Claßen, and Christian Lengauer. Extending Loop Parallelization for the Grid to Largely Decentralized Communication. In Sergei Gorlatch, Paraskevi Fragopoulou, and Thierry Priol, editors, Integrated Research in Grid Computing, CoreGRID Integration Workshop , pages 287–298. Crete University Press, 2008. Nils Ellmenreich and Christian Lengauer. Costing Stepwise Refinements of Parallel Programs. Computer Languages, Systems and Structures , 33(3–4):134–167, 2007. Special Issue on Semantics and Cost Models for High-Level Parallel Programming. Roberto Lopez-Herrejon, Don Batory, and Christian Lengauer. A Disciplined Approach to Aspect Composition. In Proceedings of the ACM SIGPLAN 2006 Workshop on Partial Evaluation and Semantics-Based Program Manipulation (PEPM 2006) , pages 68–77. ACM Press, 2006. Jia Liu, Don Batory, and Christian Lengauer. Feature Oriented Refactoring of Legacy Applications. In Proceedings of the 28th International Conference on Software Engineering (ICSE 2006) , pages 112–121. ACM Press, 2006. Jan Dünnweber, Sergei Gorlatch, Martin Griebl, Christian Lengauer, and Eduardo Argollo Dias. Making a Task Farm Component Parallelize Loops for the Grid. In Sergei Gorlatch, Marian Bubak, and Thierry Priol, editors, Integrated Resarch in Grid Computing , pages 93–103. Academic Computing Centre CYFRONET AGH, 2006. Christian Lengauer and Walid Taha (editors). Selected Contributions to the 1st MetaOCaml Workshop 2004. Science of Computer Programming , 62(1):1–2, September 2006. Sergei Gorlatch and Christian Lengauer (editors). Special Issue on Constructive Methods for Parallel Programming (CMPP 2004). Parallel Processing Letters , 15(3):237, 2005. Peter Faber, Martin Griebl, and Christian Lengauer. Polyhedral Loop Parallelization: The Fine Grain. In Michael Gerndt and Edmodf Kereku, editors, Proceedings of the 11th Workshop on Compilers for Parallel Computers (CPC 2004) , Research Report Series LRR-TUM, pages 25–36. Technische Universität München, 2004. Christian Lengauer, Don Batory, Charles Consel, and Martin Odersky (editors). Domain-Specific Program Generation , volume 3016 of Lecture Notes in Computer Science . Springer-Verlag, 2004. Christian Lengauer. Program Optimization in the Domain of High-Performance Parallelism. In Christian Lengauer, Don Batory, Charles Consel, and Martin Odersky, editors, Domain-Specific Program Generation , number 3016 in Lecture Notes in Computer Science, pages 73–91. Springer-Verlag, 2004. Martin Griebl, Peter Faber, and Christian Lengauer. Space-Time Mapping and Tiling – a Helpful Combination. Concurrency and Computation: Practice and Experience , 16(2–3):221–246, 2004. Nils Ellmenreich and Christian Lengauer. PolyAPM: Parallel Programming via Stepwise Refinement with Abstract Parallel Machines. In Ricardo Pe na and Thomas Arts, editors, Proceedings of the 14th International Workshop on the Implementation of Functional Languages (IFL 2002) , volume 2470 of Lecture Notes in Computer Science , pages 118–133. Springer-Verlag, 2003. Peter Faber, Martin Griebl, and Christian Lengauer. Replicated Placements in the Polyhedron Model. In Harald Kosch, Laszlo Böszörményi, and Hermann Hellwagner, editors, Euro-Par 2003: Parallel Processing , number 2790 in Lecture Notes in Computer Science, pages 303–308. Springer-Verlag, 2003. Christoph A. Herrmann and Christian Lengauer. Transforming Functional Prototypes to Efficient Parallel Programs. In Fethi A. Rabhi and Sergei Gorlatch, editors, Patterns and Skeletons for Parallel and Distirbuted Computing , chapter 3, pages 65–94. Springer-Verlag, 2003. Nils Ellmenreich and Christian Lengauer. Comparative Parallel Programming with PolyAPM using Abstract Parallel Machines. In Peter Knijnenburg and Paul van der Mark, editors, Proceedings of the 10th Workshop on Compilers for Parallel Computers (CPC 2003) . Leiden Institute of Advanced Computer Science, 2002. 10pp. Sergei Gorlatch and Christian Lengauer (editors). Constructive Methods for Parallel Programming , volume 10 of Advances in Computation: Theory and Practice . Nova Science Publishers, Inc., 2002. Sergei Gorlatch and Christian Lengauer (editors). Special Issue on Constructive Methods for Parallel Programming (CMPP 2002). Parallel Processing Letters , 12(2):137, 2002. Christoph A. Herrmann and Christian Lengauer. Using Metaprogramming to Parallelize Functional Specifications. Parallel Processing Letters , 12(2):193–210, 2002. Peter Faber, Martin Griebl, and Christian Lengauer. Issues of the Automatic Generation of HPF Loop Programs. In Samuel P. Midkiff et al., editor, Languages and Compilers for Parallel Computing (LCPC 2000) , number 2017 in Lecture Notes in Computer Science, pages 359–362. Springer-Verlag, 2001. Peter Faber, Martin Griebl, and Christian Lengauer. Loop-Carried Code Replacement. In Euro-Par 2001: Parallel Processing , number 2150 in Lecture Notes in Computer Science, pages 230–234. Springer-Verlag, 2001. Christoph A. Herrmann and Christian Lengauer. A Transformational Approach which Combines Size Inference and Program Optimization. In Walid Taha, editor, Semantics, Applications and Implementation of Program Generation (SAIG'01) , number 2196 in Lecture Notes in Computer Science, pages 199–218. Springer-Verlag, 2001. Cherri Pancake and Christian Lengauer (editors). Special Section on High-Performance Java. Communications of the ACM , 44(10):98–101, 2001. Christoph Wedler and Christian Lengauer. On the Parallel Implementation of a Generalized Broadcast. Parallel Algorithms and Applications , 16(1):65–82, 2001. Marco Aldinucci, Sergei Gorlatch, Christian Lengauer, and Susanna Pelagatti. Towards Parallel Programming by Transformation: The FAN Skeleton Framework. Parallel Algorithms and Applications , 16(2–3):87–121, 2001. Christoph A. Herrmann and Christian Lengauer. The HDC Compiler Project. In Proceedings of the 8th Workshop on Compilers for Parallel Computers (CPC 2000) , pages 239–254. LIP, ENS Lyon, 2000. Christian Lengauer. A Personal, Historical Perspective of Parallel Programming for High Performance. In Günter Hommel, editor, Communication-Based Systems (CBS 2000) , pages 111–118. Kluwer, 2000. Keynote. Christoph A. Herrmann and Christian Lengauer. HDC: A Higher-Order Language for Divide-and-Conquer. Parallel Processing Letters , 10(2–3):239–250, 2000. Martin Griebl, Paul Feautrier, and Christian Lengauer. Index Set Splitting. International Journal of Parallel Processing , 28(6):607–631, December 2000. Special Issue on the International Conference on Parallel Architectures and Compilation Techniques (PACT'99). Damal K. Arvind, Kemal Ebcioglu, Christian Lengauer, and Robert S. Schreiber (editors). Special Issue on Instruction-Level Parallelism and Parallelizing Compilation (Part II). International Journal of Parallel Programming , 28(5):429–430, October 2000. Damal K. Arvind, Kemal Ebcioglu, Christian Lengauer, and Robert S. Schreiber (editors). 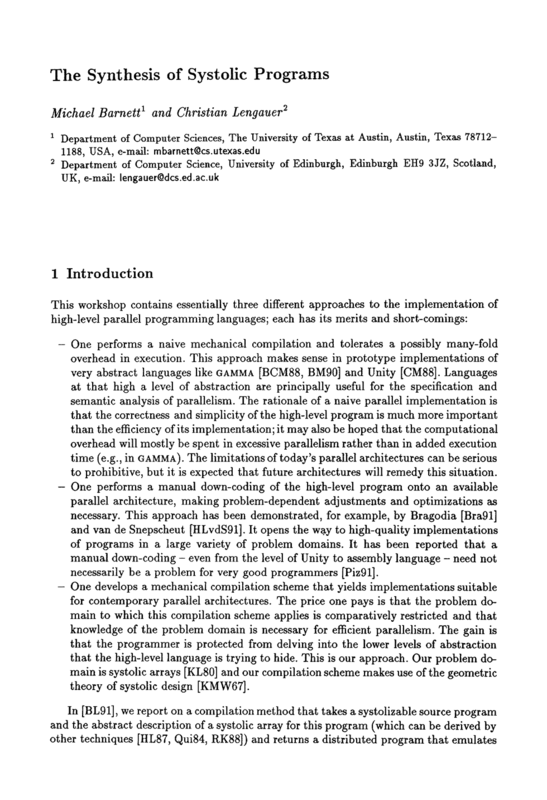 Special Issue on Instruction-Level Parallelism and Parallelizing Compilation (Part I). International Journal of Parallel Programming , 28(4):321–323, August 2000. Johan Jeuring, Christian Lengauer, and Mary Sheeran (editors). Selected Contributions to the 4th Int. Conf. on Mathematics of Program Construction (MPC'98) and Associated Workshops. Science of Computer Programming , 37(1–3), May 2000. Sergei Gorlatch and Christian Lengauer. Abstraction and Performance in the Design of Parallel Programs: An Overview of the SAT Approach. Acta Informatica , 36(9–10):761–803, April 2000. Sergei Gorlatch, Christoph Wedler, and Christian Lengauer. Optimization Rules for Programming with Collective Operations. In Proceedings of the 13th International Parallel Processing Symposium & 10th Symposium on Parallel and Distributed Processing (IPPS/SPDP'99) , pages 492–499. IEEE Computer Society Press, 1999. Nils Ellmenreich, Christian Lengauer, and Martin Griebl. Application of the Polytope Model to Functional Programs. In Larry Carter and Jeanne Ferrante, editors, Languages and Compilers for Parallel Computing (LCPC'99) , number 1863 in Lecture Notes in Computer Science, pages 219–235. Springer-Verlag, 1999. Christoph A. Herrmann, Jan Laitenberger, Christian Lengauer, and Christian Schaller. Static Parallelization of Functional Programs: Elimination of Higher-Order Functions & Optimized Inlining. In Patrick Amestoy et al., editor, Euro-Par'99: Parallel Processing , number 1685 in Lecture Notes in Computer Science, pages 930–934. Springer-Verlag, 1999. Bruno Bacci, Sergei Gorlatch, Christian Lengauer, and Susanna Pelagatti. Skeletons and Transformations in an Integrated Parallel Programming Environment. In Viktor Malyshkin, editor, Proceedings of the Fifth International Conference on Parallel Computing Technologies (PaCT-99) , number 1662 in Lecture Notes in Computer Science, pages 13–27. Springer-Verlag, 1999. Christoph A. Herrmann and Christian Lengauer. Parallelization of Divide-and-Conquer by Translation to Nested Loops. Journal of Functional Programming , 9(3):279–310, 1999. Max Geigl, Martin Griebl, and Christian Lengauer. Termination Detection in Parallel Loop Nests with while Loops. Parallel Computing , 25(12):1489–1510, 1999. Martin Griebl, Paul Feautrier, and Christian Lengauer. On Index Set Splitting. In Proceedings of the International Conference on Parallel Architectures and Compilation Techniques (PACT'99) , pages 274–282. IEEE Computer Society Press, 1999. Christoph Herrmann, Christian Lengauer, Robert Günz, Jan Laitenberger, and Christian Schaller. A Compiler for HDC. Technical Report MIP-9907, Fakultät für Mathematik und informatik, Universität Passau, May 1999. Sergei Gorlatch and Christian Lengauer. (De)Compositions Rules for Parallel Scan and Reduction. In Proceedings of the 3rd Working Conference on Massively Parallel Programming Models (MPPM'97) , pages 23–32. IEEE Computer Society Press, 1998. Nils Ellmenreich, Martin Griebl, and Christian Lengauer. Applicability of the Polytope Model to Functional Programs. In Herbert Kuchen, editor, Proceedings of the 7th International Workshop on Functional and Logic Programming . Institut für Wirtschaftsinformatik, Westf. Wilhelms-Universität Münster, 1998. Christoph A. Herrmann and Christian Lengauer. Size Inference of Nested Lists in Functional Programs. In Kevin Hammond, Antony J. T. Davie, and Chris Clack, editors, Proceedings of the 10th Int. Workshop on the Implementation of Functional Languages (IFL'98) , pages 347–364. Department of Computer Science, University College London, 1998. Martin Griebl, Christian Lengauer, and Sabine Wetzel. Code Generation in the Polytope Model. In Proceedings of the International Conference on Parallel Architectures and Compilation Techniques (PACT'98) , pages 106–111. IEEE Computer Society Press, 1998. Max Geigl, Martin Griebl, and Christian Lengauer. A Scheme for Detecting the Termination of a Parallel Loop Nest. In Proceedings of the GI/ITG FG PARS Workshop , PARS Mitteilungen Nr. 17, pages 166–175. Gesellschaft für Informatik e.V., 1998. Christoph Wedler and Christian Lengauer. On the Parallel Implementation of a Generalized Broadcast. In Proceedings of the GI/ITG FG PARS Workshop , PARS Mitteilungen Nr. 17, pages 129–139. Gesellschaft für Informatik e.V., 1998. Christoph Wedler and Christian Lengauer. On Linear List Recursion in Parallel. Acta Informatica , 35(10):875–909, October 1998. Ulrike Lechner and Christian Lengauer. Specification, Abstraction und Verification in a Concurrent Object-Oriented Language. In Max Mühlhäuser, editor, Special Issues in Object-Oriented Programming , pages 544–547. dpunkt.verlag, 1997. Martin Griebl and Christian Lengauer. The Loop Parallelizer LooPo – Announcement. In David Sehr, editor, Languages and Compilers for Parallel Computing (LCPC'96) , number 1239 in Lecture Notes in Computer Science, pages 603–604. Springer-Verlag, 1997. Nils Ellmenreich and Christian Lengauer. On Indexed Data Structures and Functional Matrix Algorithms. In John T. O'Donnell, editor, Proceedings of the Glasgow Functional Programming Workshop (GFPW'97) , 1997. Christian Lengauer, Lothar Thiele, Michael Wolfe, and Hans Zima (editors). Special Issue on Loop Parallelization. Parallel Processing Letters , 7(2):113–115, 1997. Christian Lengauer, Martin Griebl, and editors Sergei Gorlatch. Euro-Par'97: Parallel Processing , volume 1300 of Lecture Notes in Computer Science . Springer-Verlag, 1997. Christian Lengauer, Sergei Gorlatch, and Christoph A. Herrmann. The Static Parallelization of Loops and Recursions. J. Supercomputing , 11(4):333–353, 1997. Christian Lengauer, Sergei Gorlatch, and Christoph A. Herrmann. The Static Parallelization of Loops and Recursions. In Ken Barker, editor, Proceedings of the 11th Annual International Symposium on High Performance Computing Systems and Applications (HPCS'97) , pages 3–22. University of Manitoba, 1997. Keynote. Christoph Wedler and Christian Lengauer. Parallel Implementations of Combinations of Broadcast, Reduction and Scan. In Gul Agha and Stefano Russo, editors, Proceedings of the 2nd International Workshop on Software Engineering for Parallel and Distributed Systems (PDSE'97) , pages 108–119. IEEE Computer Society Press, 1997. Christoph A. Herrmann and Christian Lengauer. Transformation of Divide & Conquer to Nested Parallel Loops. In Hugh Glaser, Pieter Hartel, and Herbert Kuchen, editors, Programming Languages: Implementations, Logics, and Programs (PLILP'97) , number 1292 in Lecture Notes in Computer Science, pages 95–109. Springer-Verlag, 1997. Ulrike Lechner, Christian Lengauer, Friedericke Nickl, and Martin Wirsing. (Objects + Concurrency) & Reusability – A Proposal to Circumvent the Inheritance Anomaly. In Pierre Cointe, editor, ECOOP'96 , number 1098 in Lecture Notes in Computer Science, pages 232–247. Springer-Verlag, 1996. Martin Griebl and Christian Lengauer. Classifying Loops for Space-Time Mapping. In Luc Bougé, Pierre Fraigniaud, Anne Mignotte, and Yves Robert, editors, Euro-Par'96: Parallel Processing, Volume I , number 1123 in Lecture Notes in Computer Science, pages 467–474. Springer-Verlag, 1996. Invited. Martin Griebl and Christian Lengauer. The Loop Parallelizer LooPo. In Michael Gerndt, editor, Proceedings of the 6th Workshop on Compilers for Parallel Computers (CPC'96) , number 21 in Konferenzen des Forschungszentrums Jülich, pages 311–320. Forschungszentrum Jülich, 1996. Burkhard Freitag, Cliff B. Jones, Christian Lengauer, and Hans-Jörg Schek (editors). Special Issue on Object Orientation with Parallelism and Persistence . International Series in Engineering and Computer Science. Kluwer, 1996. Ulrike Lechner and Christian Lengauer. Modal-μ-Maude: Specification and Properties of Concurrent Objects. In Burkhard Freitag, Cliff B. Jones, Christian Lengauer, and Hans-Jörg Schek, editors, Object Orientation with Parallelism and Persistence , International Series in Engineering and Computer Science, pages 43–62. Kluwer, 1996. Christoph A. Herrmann and Christian Lengauer. On the Space-Time Mapping of a Class of Divide-and-Conquer Recursions. Parallel Processing Letters , 6(4):225–237, 1996. Christian Lengauer and Martin Griebl. On the Parallelization of Loop Nests Containing sf while Loops. In Nikolay N. Mirenkov, Qian-Ping Gu, Shietung Peng, and Stanislav Sedukhin, editors, Proceedings of the 1st Aizu International Symposium on Parallel Algorithm/Architecture Synthesis (pAs'95) , pages 10–18. IEEE Computer Society Press, 1995. Ulrike Lechner, Christian Lengauer, and Martin Wirsing. An Object-Oriented Airport: Specification and Refinement in Maude. In Egidio Astesiano, Gianna Reggio, and Andrzej Tarlecki, editors, Recent Trends in Data Types Specification , number 906 in Lecture Notes in Computer Science, pages 351–367. Springer-Verlag, 1995. Sergei Gorlatch and Christian Lengauer. Parallelization of Divide-and-Conquer in the Bird-Meertens Formalism. Formal Aspects of Computing , 7(6):663–682, 1995. Martin Griebl and Christian Lengauer. A Communication Scheme for the Distributed Execution of Loop Nests with sf while Loops. International Journal of Parallel Processing , 23(5):471–495, 1995. Christoph A. Herrmann and Christian Lengauer. Notes on the Space-Time Mapping of a Class of Divide-and-Conquer Recursions. In Proceedings of the GI/ITG FG PARS Workshop , PARS Mitteilungen Nr. 14, pages 132–139. Gesellschaft für Informatik e.V., 1995. Christoph Wedler and Christian Lengauer. Notes on the Classification of Parallel Implementations of Linearly Recursive Programs. In Proceedings of the GI/ITG FG PARS Workshop , PARS Mitteilungen Nr. 14, pages 140–147. Gesellschaft für Informatik e.V., 1995. Christian Lengauer, Patrice Quinton, Yves Robert, and Lothar Thiele (editors). Special Issue on Parallelization Techniques for Uniform Architectures. Parallel Processing Letters , 4(3):189–191, 1994. Jingling Xue and Christian Lengauer. Adapting a Sequential Algorithm for a Systolic Design. In Graham M. Megson, editor, Transformational Approaches to Systolic Design , pages 179–204. Chapman & Hall, 1994. Martin Griebl and Christian Lengauer. On the Space-Time Mapping of WHILE-Loops. Parallel Processing Letters , 4(3):221–232, 1994. Sergei Gorlatch and Christian Lengauer. Systematic Development of an SPMD Implementation Schema for Mutually Recursive Divide-and-Conquer Specifications. In Howard Jay Siegel, editor, Proceedings of the 8th International Parallel Processing Symposium (IPPS'94) , pages 369–375. IEEE Computer Society Press, 1994. Martin Griebl and Christian Lengauer. On Scanning Space-Time Mapped while Loops. In Bruno Buchberger and Jens Volkert, editors, CONPAR 94 – VAPP VI , Lecture Notes in Computer Science 854, pages 677–688. Springer-Verlag, 1994. Michael Barnett and Christian Lengauer. A Systolizing Compilation Scheme for Nested Loops with Linear Bounds. In Peter E. Lauer, editor, Functional Programming, Concurrency, Simulation and Automated Reasoning , number 693 in Lecture Notes in Computer Science, pages 374–398. Springer-Verlag, 1993. Christian Lengauer. Loop Parallelization in the Polytope Model. In Eike Best, editor, CONCUR'93 , number 715 in Lecture Notes in Computer Science, pages 398–416. Springer-Verlag, 1993. Michael Barnett and Christian Lengauer. Unimodularity and the Parallelization of Loops. Parallel Processing Letters , 2(2–3):273–281, 1992. Michael Barnett and Christian Lengauer. Unimodularity and the Parallelization of Loops. In Michel Cosnard, Maurice Nivar, and Yves Robert, editors, Algorithmique Parallèle , Études et Recherches en Informatique, pages 369–379. Masson, 1992. Jingling Xue and Christian Lengauer. The Synthesis of Control Signals for One-Dimensional Systolic Arrays. INTEGRATION , 14(1):1–32, 1992. Jingling Xue and Christian Lengauer. Specifying Control Signals for One-Dimensional Systolic Arrays by Uniform Recurrence Equations. In Patrice Quinton and Yves Robert, editors, Algorithms and Parallel VLSI Architectures II , pages 181–187. Elsevier, 1992. Davide Sangiorgi and Christian Lengauer. An Improved Systolic Array for String Correction. In Paolo Prinetti and Paolo Camurati, editors, Proceedings of the Advanced Research Workshop on Correct Hardware Design Methodologies (CHARME'91) , pages 205–218. Elsevier, 1992. Michael Barnett and Christian Lengauer. The Synthesis of Systolic Programs. In Jean-Pierre Banâtre und Daniel Le Métayer, editor, Research Directions in High-Level Parallel Programming Languages , number 574 in Lecture Notes in Computer Science, pages 309–325. Springer-Verlag, 1992. Invited. Michael Barnett and Christian Lengauer. Unimodularity Considered Non-Essential (Extended Abstract). In Luc Bougé, Michel Cosnard, Yves Robert, and Denis Trystram, editors, CONPAR 92 – VAPP V , number 634 in Lecture Notes in Computer Science, pages 659–664. Springer-Verlag, 1992. Manfred Broy and Christian Lengauer. On Denotational Versus Predicative Semantics. Journal of Computer & Systems Sciences , 42(1):1–29, 1991. Christian Lengauer, Michael Barnett, and Duncan G. Hudson. Towards Systolizing Compilation. Distributed Computing , 5(1):1–29, 1991. Jingling Xue and Christian Lengauer. A Systolic Array for Pyramidal Algorithms. Journal of VLSI Signal Processing , 3(3):237–257, 1991. Jingling Xue and Christian Lengauer. On One-Dimensional Systolic Arrays. In International Workshop on Formal Methods in VLSI Design , Miami, Florida, 1991. Christian Lengauer. A View of Systolic Design. In Nikolay N. Mirenkov, editor, Parallel Computing Technologies (PaCT-91) , pages 32–46. World Scientific, 1991. Keynote. Michael Barnett and Christian Lengauer. A Systolizing Compilation Scheme: Abstract. In Proceedings of the 1991 Int.ernational Conference on Parallel Processing, Volume II , pages 296–297. CRC Press, 1991. Christian Lengauer and Duncan G. Hudson. A Systolic Program for Gauss-Jordan Elimination. In Wim H.J. Feijen, Netty J. M. van Gasteren, David Gries, and Jadajev Misra, editors, Beauty Is Our Business , Texts and Monographs in Computer Science, pages 262–273. Springer-Verlag, 1990. Christian Lengauer. Code Generation for a Systolic Computer. Software—Practice & Experience , 20(3):261–282, 1990. Christian Lengauer and Jeffrey W. Sanders. The Projection of Systolic Programs. Formal Aspects of Computing , Volume 2, pages 273–293, 1990. Christian Lengauer, Bikash Sabata, and Farshid Arman. A Mechanically Derived Systolic Implementation of Pyramid Initialization. In Geoffrey Brown and Miriam Leeser, editors, Hardware Specification, Verification and Synthesis: Mathematical Aspects , number 408 in Lecture Notes in Computer Science, pages 90–105. Springer-Verlag, 1990. Christian Lengauer. Wie kann man imperative Programme auf eine Systolisierung vorbereiten?. In Andreas Reuter, editor, 20. GI-Jahrestagung, Volume II , number 258 in Informatik-Fachberichte, pages 527–536. Springer-Verlag, 1990. Invited. Eike Best and Christian Lengauer. Semantic Independence. Science of Computer Programming , 13(1):23–50, 1989. Christian Lengauer and Jeffrey W. Sanders. The Projection of Systolic Programs. In Jan L. A. van de Snepscheut, editor, Mathematics of Program Construction (MPC'89) , number 375 in Lecture Notes in Computer Science, pages 307–324. Springer-Verlag, 1989. Christian Lengauer, Michael Barnett, and Duncan G. Hudson. Towards Systolizing Compilation: An Overview. In Eddy Odijk, Martin Rem, and Jean-Claude Syre, editors, Parallel Architectures and Languages Europe (PARLE'89), Vol. II: Parallel Languages , number 366 in Lecture Notes in Computer Science, pages 253–272. Springer-Verlag, 1989. Chua-Huang and Christian Lengauer. An Incremental, Mechanical Development of Systolic Solutions to the Algebraic Path Problem. Acta Informatica , 27(2):97–124, November 1989. Christian Lengauer. A View of Automated Proof Checking and Proving. Annals of Operations Research , Volume 16, pages 61–80, 1988. Chua-Huang and Christian Lengauer. An Implemented Method for Incremental Systolic Design. In Jacobus W. de Bakker, A. J. Nijman, and Philip C. Treleaven, editors, Parallel Architectures and Languages in Europe (PARLE'87), Volume I: Parallel Architectures , number 258 in Lecture Notes in Computer Science, pages 160–177. Springer-Verlag, 1987. Eike Best and Christian Lengauer. Semantic Independence. In Proceedings of the 8th European Workshop on Applications and Theory of Petri Nets , pages 5–30. IBM Germany, 1987. Chua-Huang and Christian Lengauer. Mechanically Derived Systolic Solutions to the Algebraic Path Problem. In VLSI and Computers (CompEuro 87) , pages 307–310. IEEE Computer Society Press, 1987. Chua-Huang and Christian Lengauer. The Derivation of Systolic Implementations of Programs. Acta Informatica , 24(6):595–632, November 1987. Chua-Huang Huang and Christian Lengauer. The Automated Proof of a Trace Transformation for a Bitonic Sort. Theoretical Computer Science , 46(2–3):261–284, 1986. Christian Lengauer. A View of Automated Proof Checking and Proving. In International Conference on Multi-Attribute Decision Making via O.R.-Based Expert Systems , MIP-8617, pages 163–182. Fakultät für Mathematik und Informatik, Universität Passau, 1986. Christian Lengauer and Chua-Huang Huang. A Mechanically Certified Theorem about Optimal Concurrency of Sorting Networks. In Proceedings of the 13th Annual Symposium on Principles of Programming Languages (POPL'86) , pages 307–317. ACM Press, 1986. Christian Lengauer. On the Role of Automated Theorem Proving in the Compile-time Derivation of Concurrency. J. Automated Reasoning , 1(1):75–101, 1985. Christian Lengauer. Technical Correspondence: Predicative Programming. Communications of the ACM , 27(5):537–538, 1985. Christian Lengauer and Chua-Huang Huang. The Static Derivation of Concurrency and Its Mechanized Certification. In Steve D. Brookes, A. W. (Bill) Roscoe, and Glynn Winskel, editors, Seminar on Concurrency , number 197 in Lecture Notes in Computer Science, pages 131–150. Springer-Verlag, 1985. Christian Lengauer and Eric C. R. Hehner. A Methodology for Programming with Concurrency: An Informal Presentation. Science of Computer Programming , 2(1):1–18, 1982. Christian Lengauer. A Methodology for Programming with Concurrency: The Formalism. Science of Computer Programming , 2(1):19–52, 1982. Christian Lengauer. A Methodology for Programming with Concurrency. Technical Report CSRG-142, Computer Systems Research Group, University of Toronto, April 1982. PhD thesis. Christian Lengauer and Eric C. R. Hehner. A Methodology for Programming with Concurrency. In Wolfgang Händler, editor, CONPAR 81 , number 111 in Lecture Notes in Computer Science, pages 259–270. Springer-Verlag, 1981. Christian Lengauer. On the Axiomatic Verification of Concurrent Algorithms. Technical Report CSRG-94, Computer Systems Research Group, University of Toronto, August 1978. MSc thesis. Christian Lengauer and Alan Silverman. Software to Drive a GEC Elliott CAMAC Interface on a PDP-11 Computer Running the RSX-11M Executive. Nuclear Instruments and Methods , 140(3):577–597, 1977. Christian Lengauer. Strukturierter Betriebssystementwurf mit Concurrent Pascal. Technical Report HMI-B 236, Hahn-Meitner-Institute for Nuclear Research Berlin, July 1977. Diploma thesis, Department of Mathematics, Free University of Berlin. Heinz Becker and Christian Lengauer. Ein CAMAC Interface für die parallele Datenübertragung und Steuerung von Vielkanalanalysatoren. Technical Report HMI-B 176, Hahn-Meitner-Institute for Nuclear Research Berlin, July 1975. Christian Lengauer. Ein Fortran-kompatibles Programm-Paket zur Steuerung von CAMAC-Systemen durch eine PDP-11 (CA 11-A/DEC, Type 1533A/Borer). Technical Report HMI-B 161, Hahn-Meitner-Institut für Kernforschung Berlin, April 1975.